We have a large selection of unique Medieval & Renaissance style clothing for ladies, wenches and maidens to choose from. Wear our clothes to Medieval Faires, Renaissance Events, Special Occasions, SCA Events and some of the items are suitable for everyday wear! Our bodices go great with our chemises and medieval skirts. Hoop skirts and bloomers are perfect to wear under medieval dresses and gathered skirts. We have a wide selection of chemises and underdresses like the Celtic chemise, ruffled chemise and the jacquard silk chemise. Renaissance corsets will make sure everything stays in place to make the men drool. We have a huge selection of medieval and renaissance dresses and gowns to choose from. Our medieval wedding dresses and gowns are gorgeous and are made of cotton velveteen or twill cotton with extravagant trims. Finally we have put together complete medieval outfits and Wench Wear to save our customers some money. We have high quality medieval women's clothing that is sure to last you many years. Most items are machine washable, we do suggest Dry Cleaning just to ensure the long life of the article. The lavish Gypsy Wear and ensemble is sure to get you noticed at any event. Lusty Leather Bodices for Renaissance Wear. Medieval and Renaissance Chemises or (Shifts), Bloomers and Women's Underwear. These dresses are perfect for the Renaissance fairs, Medievla re-enactments, and even as bridesmaids gowns. We have a large selection of Medieval and Fantasy style dresses. Medieval and Renaissance Gowns and Dresses. Skirts, Blouses, Shirts and Vests for Medieval and Renaissance Wear. 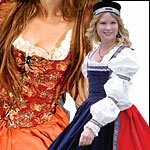 Medieval and Renaissance, Wench Sets including Bodices, Chemises and Skirts. Now you can mix and match just what you need. You already have the chemise? Now you are not forced to buy it again. Have fun and make your own costume. Enter here to find sizes to fit any woman of Royal Blood. This section contains items above a size 14, and, thanks to our sewing department, can accomodate ANY size needed.